When Jillian Hart returns home from a business trip, she discovers one of her beloved cats is missing. There clearly has been a break-in, and it's unclear whether Chablis was catnapped or got out of the house. Nothing else is missing. When her house is burglarized a second time, this time the thief caught on tape, she takes matters into her own hand and goes to confront him. Only, what she finds is a dead body. Jillian is sure the murder is tied to the cats that have been going missing around town, but the Chief of police doesn't agree. As a result, Jillian begins her own investigation with the help of her new friend and police officer, Candace. I am not sure how bold I would be, stepping into a police investigation like Jillian did, especially when murder was involved. But then isn't that part of the reason I read books like this, to live vicariously through the characters, stepping out of my own shoes for awhile? Jillian is recently widowed, she and her husband not having lived in the town long before his sudden and unexpected death. Jillian has kept mostly to herself, in the company of her three beautiful cats. As a result, as Jillian begins to step out into the town and become more social in her search for the truth, the reader meets many of the other characters in the book for the first time right alongside her. I really appreciated this approach in introducing the reader to the various characters. Like you might expect in a cozy mystery set in a small town, the other characters are varied and quite entertaining all on their own. Many of which I liked instantly and others that grew on me after awhile. Ed was perhaps my favorite. He's not only charming in a cute sort of way, he's also very resourceful. Oh, and of course the cats! They steal the show in the scenes they are in. The mystery itself was quite engaging. It didn't take me long to finish the book as I didn't want to put it down. It was a perfect book to finish and start a new year with. And the end made me smile. I look forward to reading the next in the series! You can learn more about Leann Sweeney and her books on the author's website. You can also find her on the website Cozy Chicks. 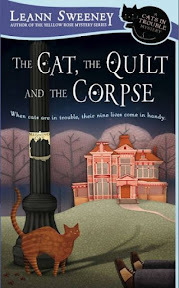 Cozy mystery involving cats? Could anything be more appealing? I'll have to remember this one...assuming it is a series. Cats, quilts, and a mystery? It is definitely a "must" read! I like the fact that this book features cats so prominently and will have to check it out. The synopsis that you posted was really intriguing to me as well. Great review on this one. It is going on my list right now!! Cozy mysteries are comfy reads this time of year :) I have an award for you. Congrats! Here is the info. I just checked and my library has this book. Think it might be a good one for a "palate cleanser" between more gritty books. I'll look forward to it. I love a good cozy mystery and this one sounds right up my alley. Great review and thanks for sharing! This does sound like a nice, cozy mystery. I love the whole cat element! I love a good cozy mystery and have been looking for a new author. I'm going to look for this one. Thanks Wendy! Now this one sounds absolutely adorable and something to spend a few hours happily reading! Sandy - Oh, yes! This is the first in a series. I'm not sure what number the author is up to, but I think there at least a couple more so far. Jenclair - It's a good start to a series! Heather (Zibilee) - I liked that feature too. The cats make for great characters and I like how real they are. Kay - I think so too. It's a nice break from the more serious books. David - There was a time when I wouldn't have picked up a pet mystery, but they really grow on you after awhile. If you do give your sister a copy, I hope she'll enjoy it (and you too)! Jaimie - Hopefully you will be able to give it a try, Jaimie. It's a nice fun read. Alice - I hope you do! I think you'd like it.